Directions: Burj Khalifa is the tallest building in the world and presents a glorious view of the human endeavour of creating a flourishing world into itself from scratch. In many ways it is the pinnacle of our achievement. 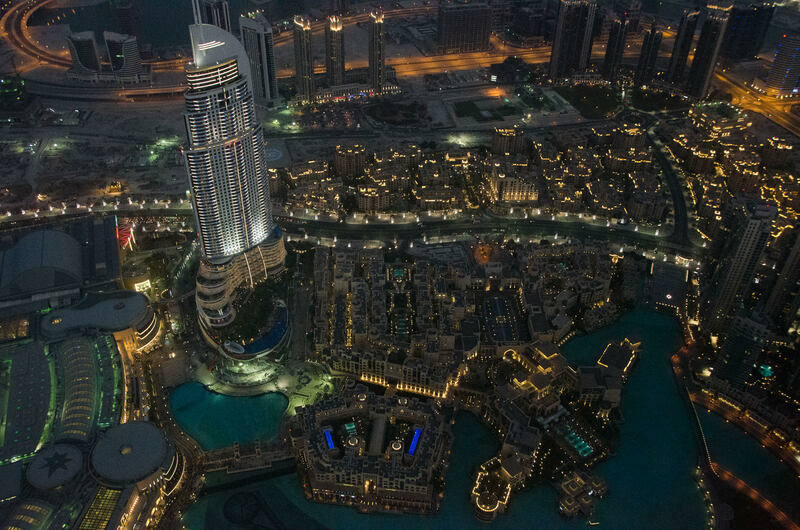 The Burj is the highlight of the city of Dubai located on the Sheikh Mohammed bin Rashid Boulevard. It is easily recognisable from a distance, from most parts of the city. The photo was taken from the topmost observation deck looking towards the glorious fountains. It was taken at around 7pm local time, when the sun had just set giving it a lovely blueish hue. The lights were just about being turned on. The photo was taken hand held, normal exposure, Auto ISO at 6400, and normal aperture f/5. This was taken through the glass of the observation deck. It is the most crowded time of the day and the challenge was to not get bumped by tourists. Time of day was the other most important part.